The world's most significant architectural structures are easily recognizable. The pyramids of Egypt and Mexico, the Great Wall of China, the Colosseum in Rome and the Taj Mahal are examples of man's earlies manufactured product. Brick has been used since 4000 B.C. Manufacturing and uses of concrete block has taken time to evolve. When first used, brick was arranged to provide a cavity between them to reduce the problem associated with water penetration. Consequently, the evolution of concrete block began approximately in 1850 where “air cells” were introduced into the manufactured block. Masonry is elemental. The materials are derived out of the earth. Its past is preserved in the ancient historic buildings. It presence is what we see around us. It future is only limited by the imagination of the architect or engineer. Masonry building structures have survived the test of time and remains unmatched in design, quality and flexibility. Building owners working with the design architect or engineer have selected masonry as the material of choice because of the great choices of sizes, color and textures. These qualities provide design flexibility to make the building stand out from the crowd. Masonry has been the material of choice for shelter for thousands of years because it provides fire resistance and thermal mass. Building owners have asked for sustainable buildings using high density concrete blocks to reduce the heat loss/gain in educational buildings. A total thermal break in the wall cavity provides materials that will not lose their energy efficiency or allow infiltration. 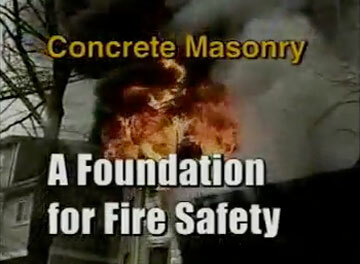 Additionally, masonry cannot burn, melt or spall and therefore provides the maximum protection from fire. Because of its versatility, masonry is very adaptable to design forms, is rich in texture and requires minimum maintenance. Concrete masonry blocks can be manufactured in a multitude of colors, shapes and sizes. The life cycle cost of these colored impregnated concrete blocks is negligible since painting is not required. Masonry does not rust, shatter, warp, dent, buckle or rot. The colors and textures used in building structures and surrounding fence walls can be used in combination and provide architectural features that are second to none. Utilizing a masonry building system allows a project to be built in the shortest period of time. The construction technique and performance of the system offers an economic advantage. A load bearing masonry system eliminates the cost of the frame or false work because the structure also serves as the enclosing wall. In masonry, building arches, circles or changes in wall direction can be easily done using concrete masonry blocks. Masonry block buildings provide the most efficient use of materials and labor and provides the greatest flexility for owners who desire to have a building structure that will stand the test of time. Unfortunately this video isn't supported in your browser. Concrete masonry is put to the test against drywall, with 2 hours of fire and a typical fire department hose stream application of 30psi.